Last week, TeenTwin 2 got a hole in her nose and at the same time might as well have driven a stake through my heart. Ok, so maybe that's a bit melodramatic but for the first hour after she came home with a shiny new nose stud I couldn't look at her for fear of the tears (mine). It was the culmination of a long mother/ teen wrangle that started some time ago. "Mum," she announced one day apropos of nothing, "I want to get my nose pierced." I didn't want her to get her nose pierced. 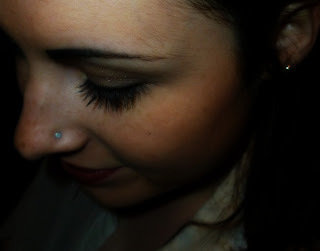 Each to their own and all that but I don't like nose piercings. Or lip piercings, or eyebrows, chins and tongue piercings. Basically any kind of facial piercings at all. If people feel that they have to make a statement about just how alternative they are, I don't understand why they have to do something so un-alternative as sticking some metal in their face. It is total conformism, just of a different type. And I'm sorry *whispers* but to me nose piercings always look like people have forgotten to wipe their noses clean after a violent sneeze or that they have a particularly odd spot that just won't go away. But mostly I didn't want the TeenTwin to have her nose pierced in case IT WENT WRONG. Google, by the way, does not in any way assuage this fear. *Shudders* I gave birth to that nose, have kissed it, tweaked it and eskimoed with it for the past 16 years.. I didn't want her to make a hole in it that wasn't designed to be there. A hole that might, whatever the infinitesimally small chances of it happening are, go badly, disfiguringly wrong. That first time we came to an "agreement." She had her bellybutton pierced instead. *Rolls eyes* And promised that would be the end of the piercings. Three months later she her ears pierced again, next to the ear-piercings she had as a reward for passing her Year Six SATS, which of course means I must share the guilt of this sudden fascination with piercing. With five more small holes in her body than she set off with, we joked darkly about turning herself into a colander and she, yet again said there would be no more piercings. But clearly TeenTwin 2 believes that my attention span can only maintain itself for three months at a time for three months after having her seconds done, she yet again wanted her nose piercing. At 16 years old she doesn't need my permission to have her nose pierced but she wanted my blessing and I was incapable of giving it. I didn't actually cling to her ankles crying "NOOOOOO" when she left the house but I wanted to. She had it done anyway. And then she promised that she wasn't going to have any more piercings. At all. Oddly enough I don't believe her. But I AM getting used to this new piercing, sort of. I have totally not asked, absentmindedly of course, whether she's got trouble with a stubborn blackhead though, to date, I CAN NOT have a conversation with her without staring at her nose.